Chocolate Coconut Cashew Fig Bars are a no-bake dessert made in 3 easy steps! This no-bake recipe is vegan, paleo, grain free, and gluten-free. Perfect for snacking on the go or a healthy dessert. No oils, flourless, and made with simple wholesome ingredients! 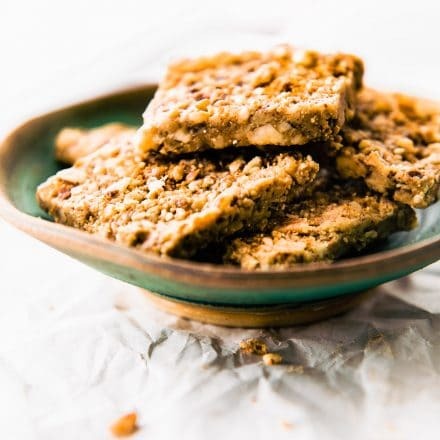 We all have that go-to snack bar or bite recipe, don’t we? Whether it be homemade vegan protein bars or store bought, there’s one that just clicks with us and stays with us. 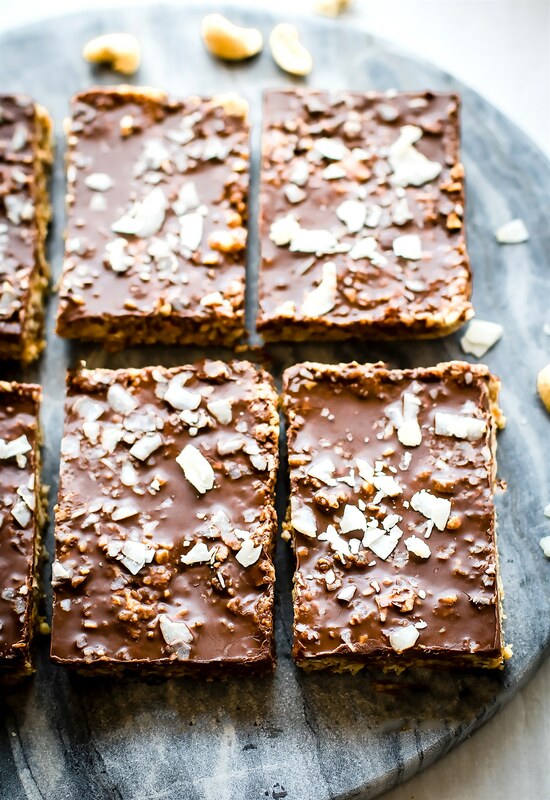 We love no-bake paleo mango protein bars and 3 step Baklava Bars. One nutty, one fruity. Hands down our favorites! And so easy. Chewy and lightly sweet. But what happens when your need for dark chocolate, coconut, and nuts take over? Kind of like a Mounds bar. Well, except way better and made with real food. I may be biased. 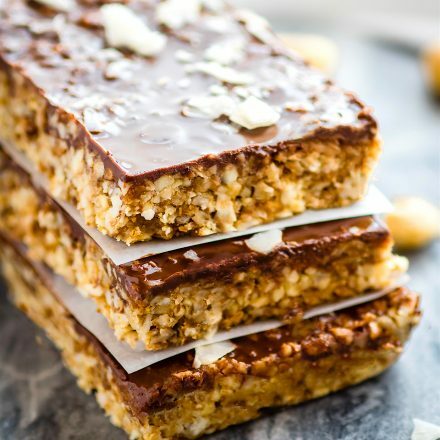 Healthy no bake snack bars to the rescue! These no bake chocolate cashew fig bars are our new go-to snack. 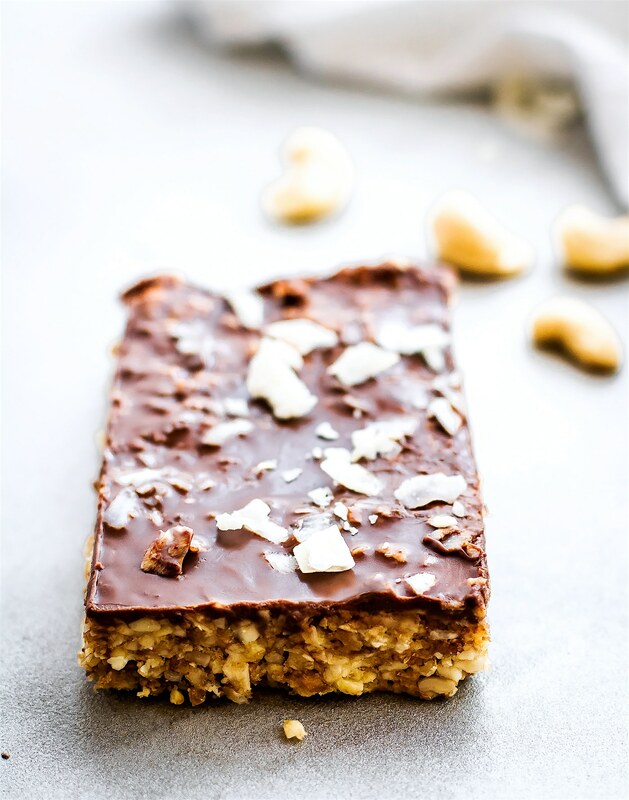 A combination of energy bar, dessert bar, paleo/vegan bar… and all things heavenly bar. No honey or sugar needed. Just a quick 3 step approach! Chop chop in the food processor, press into a pan, and melt dark chocolate to coat the top of the bars! Set them in the fridge for a bit to harden and set. Slice and serve. Or do what I do; wrap each one in foil and place into the fridge for a quick grab and go snack. I think you’ll love these ideas. Tried and tested. And they go fast… Just sayin’. You might want to make multiple batches. Lunch Box! Yes, these are peanut free and they look like a candy bar. Kids will be SUPER happy and healthy. Plus these bars are both paleo and vegan so they accommodate to a lot of allergy-friendly kiddos, ya know? Oh and while you’re at it, throw in some of these oatmeal cookie energy bites for the lunch box. Pre or Post Workout Fuel. Natural fruit and nut carbohydrates for energy. The coconut is great because it contains a boost in iron while cashews give these bars a little protein boost. Both NEEDED for those muscles. FUEL and RECOVERY. Healthy Dessert. Need I same more? These naturally sweetened dark chocolate cashew fig bars are seriously like candy bars. I mentioned Mounds bars above, but have you ever had a Mars bar? Oh, they are the kiwi’s favorite, and these definitely hit the spot for his New Zealand chocolate coated candy bar craving. Bonus Nutrition Fact because I am a NERD –> Both cashew and dried figs are both a great source of vitamin k. I love me some VITAMIN K! You know this from my cashew creamy mustard Brussel Sprouts superfood salad. So maybe you should eat the Brussel Sprouts salad for lunch followed with one of these no bake dark chocolate cashews bars. Then you will be one “SUPERFOOD” powered HUMAN! Just a suggestion. I know what you’re thinking. ” that’s cool Lindsay, but how do these no-bake bars actually stick together then?” You were thinking that, right? Haha. I’ll give you a hint. They are in season. They are delicious. They are full of powerful anti-cancer fighting nutrients. They are amazing when dried. Combining dried Turkish figs with dark chocolate, coconut, and cashew create one heck of a power bar! Healthy fats, fiber, and a hefty amount of antioxidants! When figs are dried, their health benefits and nutrients INCREASE! YEA buddy! I knew this fruit was a real gem. Figs are also rich in potassium and magnesium, which is good news for those who don’t like bananas but need these crucial minerals. Nature’s candy really does wonders y’all! But what I love about these no bake dark chocolate cashew bars sweetened with figs is that they don’t even look healthy. Is that wrong to say? Nah…. chocolate, coconut, cashew, figs –> AMAZIN’! 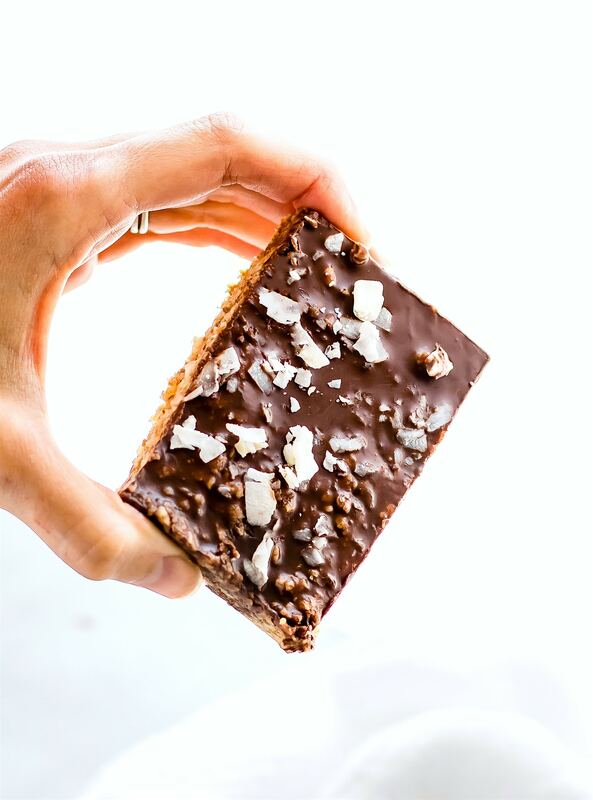 Speaking of AMAZIN’ and more NO BAKE chocolate, coconut, and cashew… These No Bake Gluten Free Chocolate Coconut Oat Squares from Gluten Free Palate look unreal. 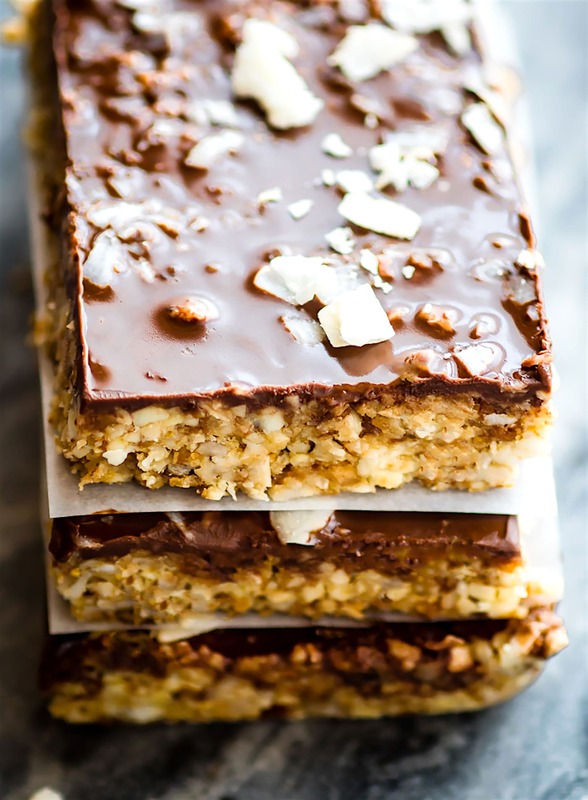 Healthy homemade bars to make on any occasion! YUM! Alright, ready to not bake and just blend? Yea, let’s get our easy snack-making skills on! 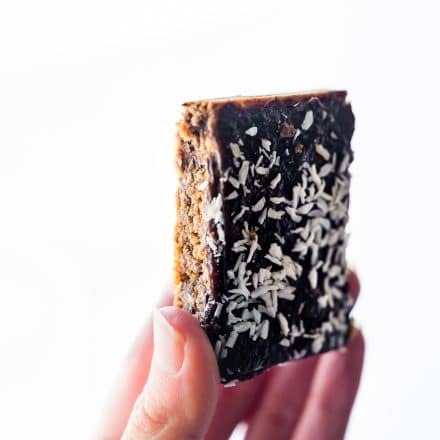 Here’s the recipe for no-bake chocolate coconut cashew fig bars! Chocolate Coconut Cashew Fig Bars are a no-bake dessert made in 3 easy steps! This no-bake recipe is vegan, paleo, grain free, and gluten-free. optional add-ins 1 tbsp protein powder, chia, nuts, cocoa powder. Line a square baking pan with parchment paper. Set aside. Next make sure your dried figs have all the stems cut off. 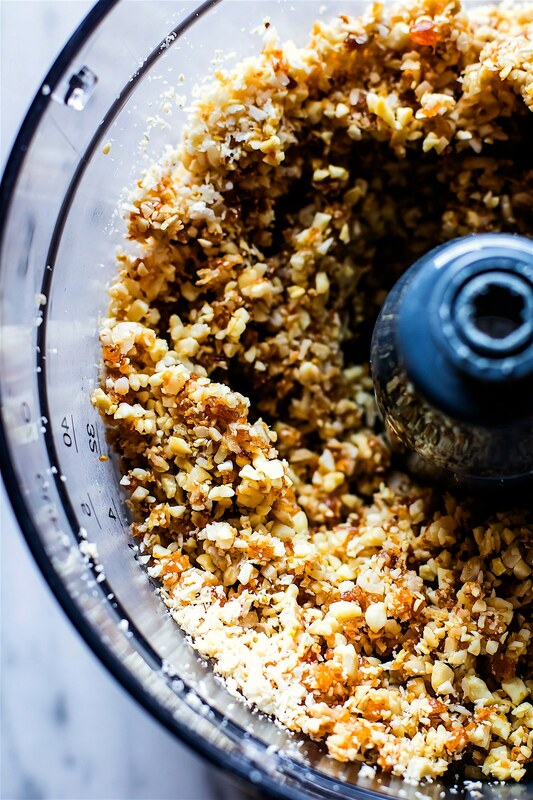 Place cashew, coconut, salt, vanilla, and figs in food processor. Blend until all is mixed well but not pureed. See pictures above. Pour mixture into baking dish and press down well. See notes if you are not getting it to stick well. While the fig/cashew mix sets in pan, melt your dark chocolate. 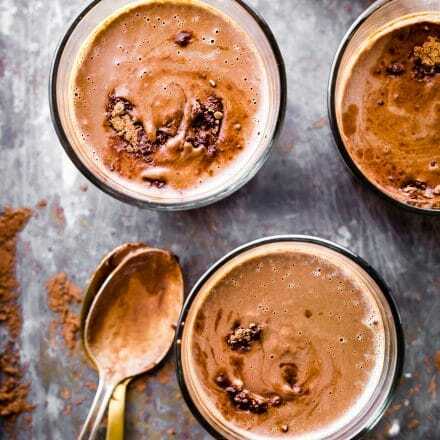 Place dark chocolate in a microwave safe bowl or on stove top. Heat until melted. About 60-90 seconds in microwave mixing half way. You can also use my homemade magic chocolate shell recipe if you want a thicker chocolate coat. Next pour the chocolate over the cashew coconut batter and spread it evenly in the dish to cover all. noted if you need more dark chocolate to cover, just melt an additional 1/4 cup. Sprinkle extra coconut and dash of sea salt on top of chocolate (evenly). Place in freezer for 20 minutes or fridge for a few hrs. Once they are hardened, remove from fridge. Slice into bars and wrap each one in foil for a quick grab and go bar. Or store in an air tight container. Best kept in fridge for freshness. Feel free to freezer for up to 8-10 weeks. These really do keep well! If your batter is not sticking to the pan after mixing, remove from pan and place in a bowl, mix in a tbs of honey or maple syrup if needed. If the batter is too sticky, add in 1 tbsp of coconut flour. An 8×8 pan or 9×13 will work. Your bars will be thinner with 9×13. Figs – depending on the type of dried fig you use, you made need to use more than 5oz to get it “sticky” in the batter. Chocolate -Use as much or as little as you’d like to on top. The less you use, the thinner the layer of chocolate and vice versa. These make great meal bars, cut in 6 LARGER Bars if desired. They will be around 300 calories each. And now it’s time for the extreme close up. Swooooooooon over the chocolate fig bars! 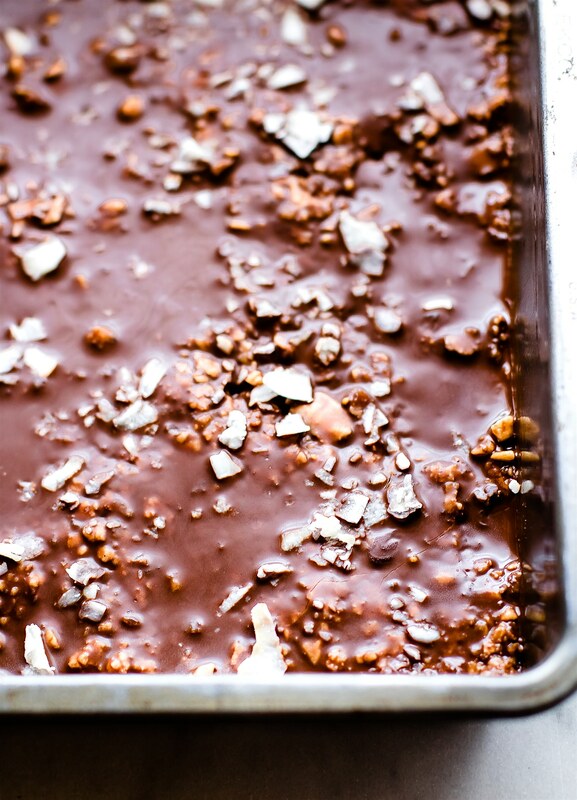 Don’t you wish you could reach through the screen for some no-bake chocolate fig bars right now? I sure do. I need to make more fig bars… ASAP. Sigh. What’s your favorite bar recipe? No bake chocolate types or dried fruit and oat type? Big life decisions here ya’ll. Haha you’re right that they don’t look healthy, in a good way! 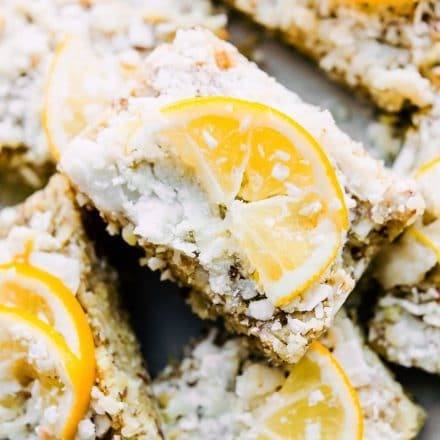 Love all your no bake bars and bites. And figs – have to try them in bars! yes you would so love with ganache too! Oh my, totally swooning over here! Anything cashew in in on. These look SO GOOD! 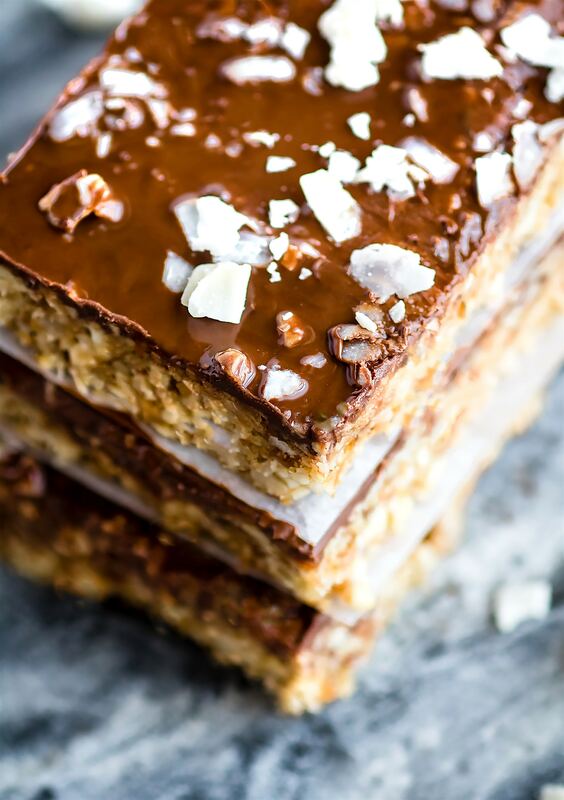 It’s like all my favorite things in one no bake bar! I want to reach for the screen every single time you post hahaha!! Yummy! oh I love you! and so thought of you with these! My gaaaawsh these BARS! That fig-coconut-chocolate-cashew combo? Heeeeaven! 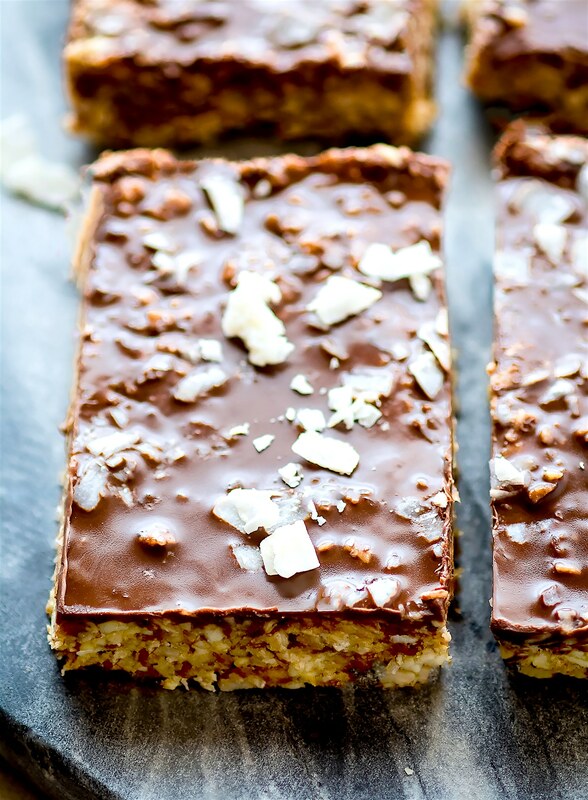 These bars are seriously my idea of the perfect treat or snack. I’ve used dried figs to make chocolate truffles and loved the way they turned out, so I’m itching to make these beauties! oh i need to try your recipe next! FIGS <3 My favorite things 😀 O these are so pretty, easy,….and overly delicious, Lindsay! Thanks fellow fig lover friend! I love the chocolate coconut combo! I make some variation of nut/dried fruit balls or bars almost every week. My favorite easy treat! These look fantastic. thanks friend! I love your bar/bite recipes! Chocolate and coconut is one of my favorite flavor combos! These are so simple, but I bet they taste amazing! These bars look beyond decadent. Such a great recipe. You make healthy look fabulous. Hahahaha, chocolate and cashews are a power couple! I absolutely love this recipe–the topping looks splendid! These look amazing and I am loving that they are just 3 ingredients. Made these yesterday. So easy to make, and doubly delicious. I did have trouble getting the mixture to stick together, so added a tablespoon of maple syrup. Still not sticking! Added another tablespoon maple syrup. Better! Put in pan and smushed down. They were really hard to cut, but they completely fell apart. Any suggestions? Oh i am so sorry. Let’s fix that! what coconut and fig did you use? Did you parchment paper on bottom? Sorry it took so long to respond. I used unsweetened flaked coconut from Bob’s Red Mill and Smyrna Figs in a bag from Costco. That’s strange, those should work. Hmmm… the only other tip I think that might help is to blend the figs a little more with the cashew/coconut. Then place them in a bowl and mix all together before placing in the pan. Add maple syrup if needed in the bowl. Email me anytime if you want to make it again with these adjustments. I will definitely make them again because the family loved them even though we ate them with a spoon! Just a thought, I didn’t soak the cashews. I think next time I’m going to add one extra fig cause they are sooooo good. FIGS IN THESE BARS?! You are my hero! I’ve been wanting to try figs in a lara-bar type creation! These are incredible. I would love to reach through the screen and grab one of these. The use of dried figs is genius and cashews are so rich and buttery. I can only imagine how amazing these taste. Licks lips. Did I miss something? Making these now, and do they smell gooooood!! However, pouring into an 8×8 seems to be too small.. did you use a 9×13? I used 8×8 so they would thicker but 9×13 should work too. They will taste same just different thickness. Does that make sense? It does make sense, they just looked a lot thicker than the picture.. so I went with a 9×13. The 9×13 must be the key, they look perfect. I also added to make a 1/2 c of the melted dark chocolate (enjoy life) chips to get that thin layer allll the way to the edges. I added your suggestions of protein powder and chia seeds. OMG, they look and smell sooooo good, I can’ hardly wait for them to chill, so I’ll go chill ~ Thank you for this delicious (healthy) snack recipe. Hi, thanks for sharing this awesome recipe! One question though: Should the cashews be soaked prior to processing them? they don’t need to be. I did have one ready try that though and it worked great. Might be a little softer bar. Let me know if you try them Saleha! Love this recipe! But we have a fig allergy in the house. Any recommendations for a substitute? I’m thinking dried apricots? I just made your loaded oatmeal cookie energy bites and I gotta say there is nothing worse than having a batch going and it sSTICKS to your hands!!!!!!!! Grrrrrrrrrr this is my new pet peeve !!! You need the honey so they stick together then it’s such a mess sticking to your hands!!! Would clear and concise measurements so this does not happen . very frustrating !!!! Found today- made today ? I was worried my mixture wasn’t sticky enough so added 2 tbsp of cashew butter and it was great. Looking forward to trying these tomorrow and taking them away for a hiking weekend. Oh I am so glad!! Love the addition of nuts on top. Sounds perfect Joanna! Oh i make multiple batches and kept in fridge or freezer. they last a while! for sure. at least 4 weeks. longer in freezer if you need to make a bunch. Hope that helps! Just got everything together and realised, I don;t own a food processor 🙁 Everythign is just in really small pieces and not stuck together at all! OK, phew! Turns out it is not the food processor that the issue, it;s the stickyness. Not sticky at all so I have added some honey – hopefully now it is not too sweet. Should the figs be soaked maybe first? did you use a food processor? What kind of figs did you use? I found turkish to work best. Yes, soaking can help. KEep me posted! I used the container base of a hand held blender. (that has it’s own blade for chopping.) the nuts came out all small which was the perfect size. But then the fig also just came out in small bits.. I’m not sure of the kind of figs there is only 1 kind at the fruit store I go to. I’ll try to find out. the whole batch was eaten!! Even my fussy daughter had a few pieces!! Yep it worked but quite crumbly. Can only find 1 type of dried fig in my area and they are not sure where it is from. They seem to be split open and squashed. Will post my batch on Twitter now and try another batch soon! Hmmm I wonder why. Did you soak figs? so sorry! These look amazing! 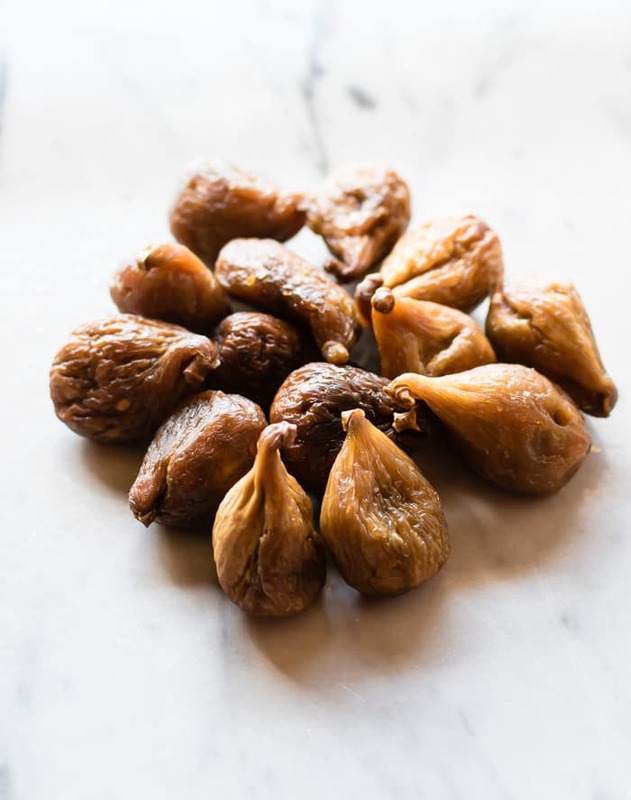 Could you substitute dates for the figs? Would it be the same amount? Really looking forward to trying these! sure! I think someone else used dates before.Similar about but not be as sticky. trying soaking the dates a little before. Keep me posted! Holy cow!! These were amazing! Such a great snack or even a little after dinner treat. My husband and I loved them. I’ll be making them on repeat. Wonderful! SO glad Kelli! WE love them too. thanks Georgie! Let me know if you try them! The enjoy life dark chocolate? I think it’s just cane sugar juice. But I will give paleo dark chocolate option, updating now! Thanks for the correction.